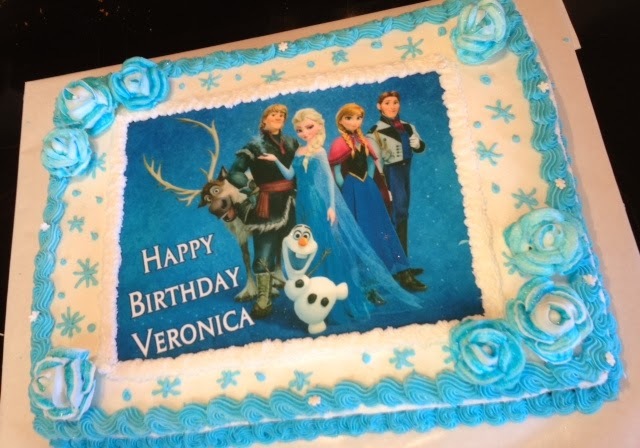 Today we celebrated Veronica's 7th birthday (a little early) at Chuck E. Cheese! She handed out around 35 invitations to school and dancing friends. ONE of them said they were coming and cancelled the next day. Yes.... out of 35 we had one response. People just don't RSVP and I hate that, especially at places with a per person charge. We had our "usual suspects" attending aka friends who always come no matter what! Thankfully a few school friends showed up after all and Roni was soooo happy. We ended up with 15 kids, which is a pretty good turn out for us. As cheesy as Chuck E. Cheese can be, the parties always go well and kids sure had a blast. It's been a long six months of struggling to do the ordinary tasks from day to day. Ordinary things like grocery shopping, school events, and even housework have felt like unsurpassable mountains. The pain in my left leg has been a great obstacle that affected every aspect of my life. Sleeping, showering, cooking, and even driving.... When a body part hurts it makes you feel bad in general all the time. Months of this have really worn me down. I've cried lots of tears over all the things that I needed/wanted to do but couldn't. Moms know how hard it is to be a Mom when you are sick. Imagine having to climb that mountain every day with no help. Clint is often in Texas, so it's just me. The kids, the house, the cats...everything in between. Just me. Hurting, not well, me. You would think that other Moms would be the first to realize this. There's always that one exception. I became friendly with a neighbor who has a daughter Veronica's age about two years ago. The daughter (M) and Valerie became fast friends on the bus, and when Veronica was about to start public school is when I met them. I naively made the mistake of offering my assistance before or after school if there was ever a time that the Mom had to be at work early or late and needed someone to keep M. Little did I know she would jump all over that and take full advantage of my offer. Advantage being the key word. I did not know at the time that there would be a constant barrage of requests to pick M up, drive her to dancing, put her on and off the bus. If I failed to answer my phone, I learned to expect a knock on my door feigning concern.... "are you ok because you are not answering and by the way can you bring M to dancing because I have a meeting and (husband) doesn't feel like bringing her." The requests came on the weekends, after I had already watched her a few afternoons. Even during the summer, Mom would casually send M to my house at 11:30am, absolutely starving, which left me adding another person to my grocery bill. She wouldn't pick her up until 6 or so, sometimes almost dark... My girls went to her house ONCE all summer only to have her bring them back after a few hours because Mom had somewhere to go, with M in tow dressed in a swimsuit ready to stay here. As time passed, I noticed I never heard from the Mom otherwise. She never said hello or how was your doctor's visit or Merry Christmas. Sometimes weeks would pass and then out of the blue "Hey can you watch M." No hello, hi, how are y'all... did you enjoy your vacation? Nothing except I need you now so I will talk to you now. The whole leg issue has been the last straw. The Mom knew full well I felt awful. The Mom had told me on several occasions that I looked "terrible" or like I was "in pain." Yet she still continued to send M over here. The last straw was when the husband was off of work for two weeks and was very well capable of making an effort to be home at 3:45 to get M off the bus, but no.... Somehow he was able to make himself available pick up the Mom from work at 4pm, just blocks from home, but was unable to bother to make the effort to be home at 3:45 for the bus. (Oh just let her get off at Mel's house so I don't have to worry about being back.) I'm sorry but that is just lazy parenting. The very final straw was the day the bus was late. My girls were outside waiting for the bus, and the Mom passed in front of my house with out stopping. She brought M to school on her way to work and just passed my girls by. AFTER ALL THE TIMES I HAVE LOOKED AFTER YOUR KID, FED YOUR KID, DROVE HER TO SCHOOL AND DANCING, and the one time mine are in need of a ride and you are going that way anyway..... and you ignore them and leave them like dogs begging on the side of the road. I admit I was not very nice to M after all that. I know it's not the child's fault, but she is also not my responsibility. I was tired of being nice and tired of being taken advantage of, especially when I am not well enough to look after my own kids some days. It's not up to me to feed M and provide for her. I told her no more snacks because I couldn't afford to keep feeding her. And I stuck to it. Apparently she finally said something to the Mom because M hasn't been here in weeks. The Mom no longer waves or slows down as she passes in front of my house numerous times during the day. I guess she is angry that I don't want to watch M anymore. But what does she expect.... I don't mind helping at all when it is truly needed, but being taken advantage of is something different. This Mom (me) has had enough. This was us, exactly eleven years ago!! 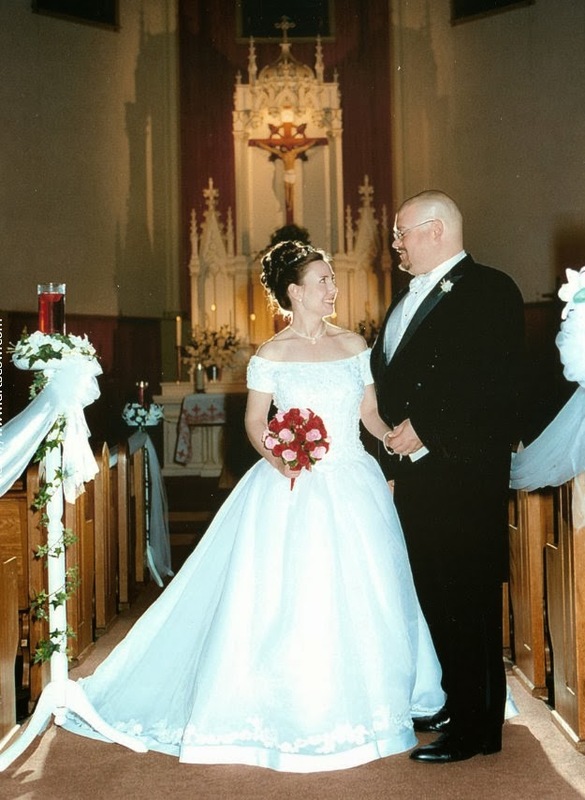 On Friday, February 14, 2003, in front of our family and friends we married during a candlelight ceremony. Eleven years ago... where has the time gone?!? A lot has changed since then. 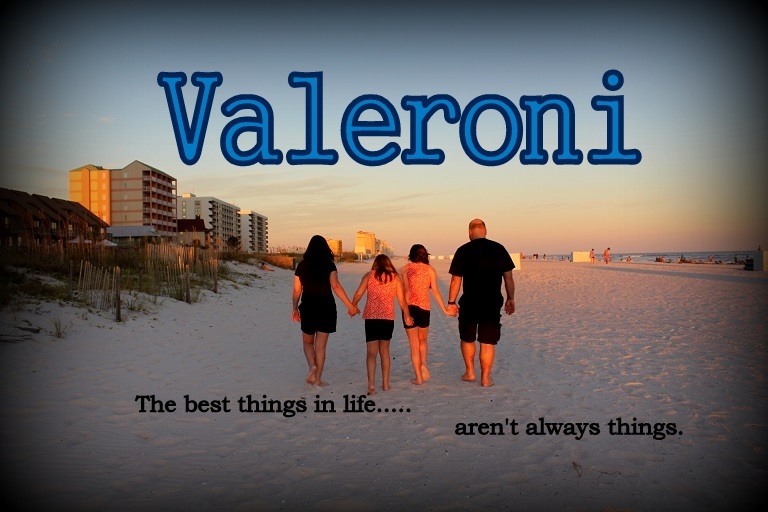 We built a house, then began our little family by adding Valerie and Veronica. We've had our shares of ups ... good and bad times..... and downs that left me reeling and doubting that this would ever last. But we have over come many obstacles. And we are still here, still together. I couldn't imagine life any other way. It's getting close to Carnival Time here in South Louisiana, so that means one thing.... the shelves are loaded down with KING CAKES!! King Cakes are big business around here. There are Christmas King Cakes, Valentine King cakes, football King Cakes.... Still though, it is forever a symbol of Mardi Gras. It seems I am always in search of the best king cake. I do not care for the grocery store cakes. Most are dry and too bread like. The bakeries sometimes have pretty good cakes, but again some are just too bread like! The doughnut places are always good because they are simply a giant doughnut. What's not to love about a doughnut as big as your head?!? I also do not care for the icky sticky crunchy sugar/sprinkles on some. A little is ok, but sometimes it is all crunchy sugar and nothing else. Last year I spent an entire day baking one from scratch. It was amazing, but also a lot of work. This year, after sampling a few "ok" King Cakes from around town, I decided to make my own again. I'm sure most of you are familiar with the Taco Ring made out of crescent rolls. This is similar, except we will make it into a King Cake instead!! Anyone can make this. It is so simple and no one will ever know it is made from crescent rolls if you don't tell. purple, gold, and green food coloring. Make the 'taco ring' shape with your crescent rolls. Try to overlap them a bit so you'll have less open spaces. Then spoon in your filling. Mine is half cinnamon/sugar and half cream cheese. Then, let it cool a bit while you mix up the icing. I melted a few spoons of butter on the stove and added powdered sugar and almond extract. I added water a small bit at a time and stirred until it was the consistency I wanted it to be. Then I colored it purple, green, and gold and drizzled it all over. 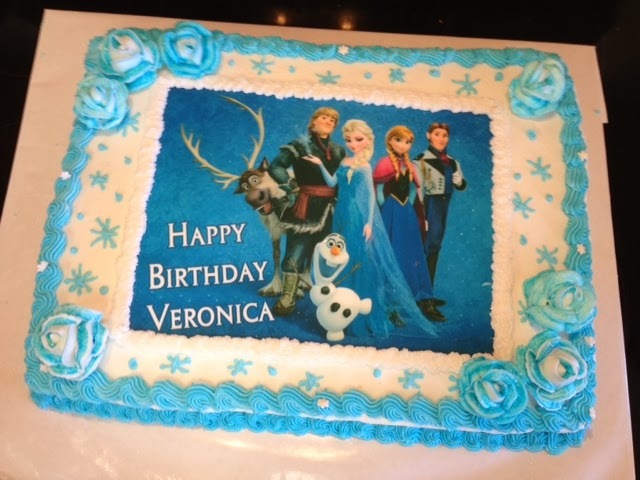 Of course, if you like the crunchy sugar, you can always add colored sugar or colored sprinkles on top of the icing. YUMMY!!! I have to say it was pretty darn good. My kids loved it. My husband loved it. And I had more than a few pieces myself. If you want to hide a baby in the cake but do not have one, a bean would work just fine. Tradition is whoever gets the piece with the baby has to buy (or in this case bake!) the next King Cake!! Just be sure you tell your guests that there is an object in the cake!! Finally, after a few months of waiting Veronica was chosen Student of the Month!! She has really been trying so hard. Her teacher sent home the nicest note saying she was selected because of her ability to follow rules, her kind attitude, her attendance, her preparedness, dedication, and helpfullness! I surprised her at the ceremony with balloons and flowers. I hope she knows how special she is to me and how proud I am of her! !